Is Aaron Ramsey on the verge of Arsenal exit? Aaron Ramsey: is an Arsenal exit on the cards? For many Arsenal fans, Aaron Ramsey is the obvious candidate to take over the Gunners' armband now that Unai Emery has arrived and seeking change. However, with contract talks reaching an impasse; is the Welshman about to leave the Emirates? The departure of Arsene Wenger at Arsenal - and alongside it the numerous familiar faces in whom the Arsenal manager put his faith in also leaving the club - signalled the beginning of major change at the Gunners, spearheaded and supported by chairman Ivan Gazidis. Unai Emery appears to have decided that the likes of Jack Wilshere will not be a part of his game plan for the upcoming season and it seems that the Spanish coach is intent on bringing his own brand of football to the Emirates Stadium. Change is always tricky for any Premier League club, and many Arsenal fans are split. On one side, a large continent of Gunners fans would have preferred to have kept the faith with Arsene Wenger in charge; on the other half a crew of Arsenal fans delighted that their manager of 22 years finally left. However, for the second group, what is currently happening at Arsenal is probably not what those fans would have hoped. What seems to be the start of a major overhaul of the playing squad by Emery has left exposed gaps throughout Arsenal's squad. If Aaron Ramsey does decide to depart, that will leave a huge creative space at the heart of Arsenal's midfield. Yet again it is another huge rival of Arsenal in the race for the club's star players. Chelsea, also under new management, are in pole position to secure a transfer deal for Ramsey before the transfer window closes and new Blues manager Sarri has identified Ramsey as a player that he can build his team around for the new season. 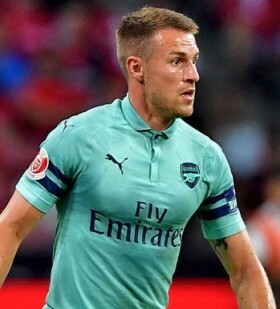 Ramsey has been locked in talks with Arsenal over a new contract for over six months, and in a recent interview with reporters the Welshman suggested that an agreement is nowhere near close and that his agent has been in regular contact with Gunners' representatives. Ramsey has given no hint as to what his demands are and whether they are purely financial or if he is seeking a new challenge. There is also, of course, interest from abroad for Ramsey. With the transfer window closing early this summer for Premier League clubs; a move abroad could suit Ramsey. Welsh compatriot Gareth Bale has proved that a transfer to Spain works for players from the United Kingdom and Bale would no doubt love to link up with his international colleague in La Liga. It's not just Real Madrid that are rumoured to be in the race to sign Ramsey, but also bitter rivals Barcelona are still rumoured to be in the market to sign a midfielder as a replacement for Paulinho. Whatever the situation, Arsenal fans will be glued to the news over the upcoming days to see exactly how Aaron Ramsey's situation pans out.